Low Voltage Re-Settable Supplementary Protector. 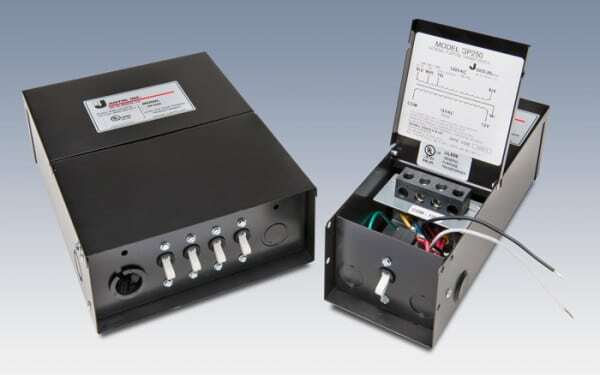 All GP series transformer inputs are suitable for connection to dimmers specifically designed for use with magnetic or inductive circuits. TESTED EXAMPLE: Lutron Corporation Model NLV-1000 Low Voltage Dimmer. GP100 120V .92 A 50/60 HZ to 12VAC 100VA – 1 Circuit 11″H x 4″W x 4″D 6 LB. GP100-24 120V .92 A 50/60 HZ to 24VAC 100VA – 1 Circuit 11″H x 4″W x 4″D 6 LB. GP250 120V 2.3A 50/60 HZ to 12VAC, 250VA – 1 Circuit 11″H x 4″W x 4″D 12 LB. GP250-24 120V 2.3A 50/60 HZ to 24VAC, 250VA – 1 Circuit 11″H x 4″W x 4″D 12 LB. GP500 120V 4.6A 50/60 HZ to 12VAC, 250VA x 2 Circuit to 24VAC, 500VA x 1 Circuit 11″H x 4″W x 4″D 14 Lb. GP1000 120V 9.2A 50/60 HZ to 12VAC, 250VA x 4 Circuit to 24VAC, 500VA x 2 Circuit 11″H x 8″W x 4″D 28 LB. Input Voltages of 208, 240, or 277 are Available…Order “-208”, “-240”, or “-277”. For input line cord…Order “-LC”.